Four slain seniors were honored Sunday at Marjory Stoneman Douglas High School's graduation. NBC 6 Reporter Laura Rodriguez explains. 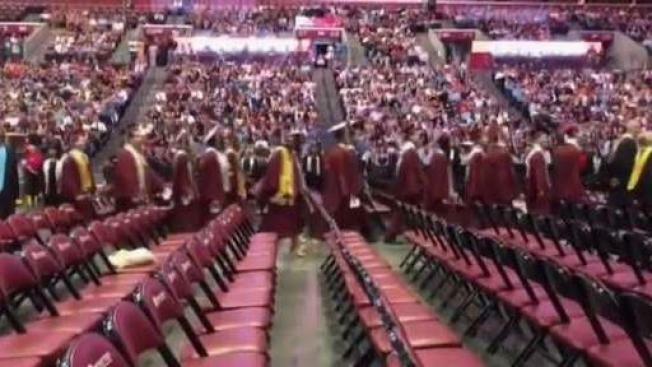 The senior class from Marjory Stoneman Douglas High School gathered Sunday for an emotional graduation ceremony, as they honor four classmates who lost their lives in a February mass shooting. Seniors Nicholas Dworet, Joaquin Oliver, Meadow Pollack and Carmen Schentrup were among the 17 people killed during the harrowing Feb. 14 massacre at the Florida school. Their family members accepted their diplomas on their behalf during the Sunday ceremony. Emotions were high even before the 2 p.m. ceremony began. April Schentrup, Carmen's mother, said that graduation day is "too painful to celebrate" without her daughter, but added that she is proud of Carmen's friends and classmates for their accomplishments. "They've overcome so much. I know they will [continue] to make positive changes," April Schentrup wrote on Twitter Sunday morning. Hunter Pollack, Meadow's brother, said graduation was "the day my sister has been waiting for." "Graduation where she would’ve been getting her diploma and be on her way to attend college," Hunter Pollack wrote on Twitter Sunday morning. "This is a sad day, as I will be walking [the] stage to get her diploma for her." The graduation ceremony was held at the BB&T Center in Sunrise, which has the capacity to hold about 20,000 people. But the Broward County School District kept the event private. Only invited guests were set to be admitted and the media has been barred from inside the arena. Scenes from inside the arena began to circulate on social media before the ceremony had ended. Attendees posted tweets and videos after comedian and host of NBC's 'Tonight Show' Jimmy Fallon gave a commencement address, bringing humor to a bittersweet day. The school's choir also performed "Shine," a song written by two MSD students in the days after the shooting took place. "Today you are graduating from high school. You should be incredibly proud of yourselves," Fallon said, according to videos posted on social media. "That doesn't mean you should rest on your laurels — or your yannys. Some of you will grow up to hear laurel or yanny, but the most important thing is that neither of these things will matter by the end of summer. What will matter is that you — the class of 2018, will have graduated. You won't be classmates anymore, you will be adults who Facebook search each other at two in the morning for the next ten years." The students, their families, and the teachers and the staff who make up the Parkland school community have endured and persisted. Classes resumed just weeks after the walls of the school's 1200 building were riddled with bullets that took the lives of 14 students and three staff members. While students — some fearful, some emotionally fatigued — firmly carried on with their studies, many also became civically engaged with the clear goal to do whatever in their power to prevent school shootings such as the one that shook their own lives from happening again. Some of the graduating teenagers carry a considerable weight on their conscience as they traverse the decisions they confront ahead of adulthood. David Hogg, one of the leading figures in the youth-led gun reform movement who also graduates Sunday, is taking a year off before starting college to focus on activism. "I feel like I kind of have a bigger purpose right now," Hogg said. "People go to college to change the world and I feel like our entire movement ... we're already doing that."